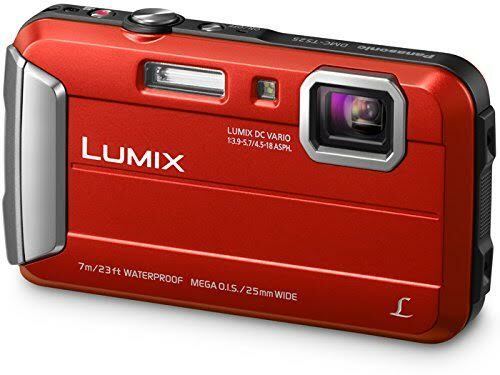 If you are looking for a tough and rugged digital camera at an affordable price point, you can consider Panasonic TS25. Well, truth to be told, it is not the most powerful camera out there. But it can deliver excellent image quality for casual and documentary use. It is especially awesome because of the weatherproof construction. It can endure rain and splashes without any problem. So, you can take it outside and take shots after shots without worrying about the weather! Panasonic TS25 is equipped with a 25-100mm F/3.9-5.7 zoom lens that has a built-in optical image stabilization. The lens can provide up to 4x optical zoom, 8x intelligent zoom. The intelligent zoom is basically a digital zoom, but with enhanced quality to keep the sharpness good. Thanks to the image stabilization, Panasonic TS25 is very friendly to casual users. The images are still sharp and crisp, without a significant blur, even though they are shot by unstable hands. The image sensor is a 16 MP CCD sensor, which is a rather old technology. The image quality is nice. It shots sharp and crisp pictures. The colors are vibrant and vivid. However, it is not exactly a fast camera. It only has 1 fps continuous shooting speed. In addition, it record videos in 1280 x 720, which is actually good, but not great, as many products nowadays already offer 1920 x 1080 videos. The AF system is pretty fast and usable, and it detects and focuses on faces well. There is a built-in flash that is handy for low-light conditions. There is also a memory card slot for additional storage, in addition to the internal memory that has about 70 MB capacity. Check the best price of Panasonic TS25 here!